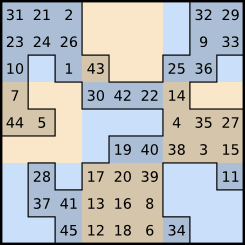 The shape of the darker region is “magic” because the number of cells in each 3×3 block corresponds to a number in a magic square, while the number of cells in each row, column, and main diagonal is 5. The sum of the numbers in each row and column is 115. Problem #21.1 Find a magic magic 45-omino, as above, but with diagonals adding to the magic sum. It’s interesting that this solution was found by manually tweaking the output of a program that I wrote to solve the problem. I was never able to get the program to find an actual solution, so I had it give up after a certain number of trials and output the best near solution. There may well be a large number of solutions, but the search space is enormous. Feel free to look at my solver code (in Python). I do wonder if there is some way it can be fixed up to be better at getting from near solutions to real solutions.